There were three major attempts to resurrect old franchises this summer: Mad Max: Fury Road, Terminator Genisys, and Jurassic World. One was a critical hit with modest commercial success, one was a failure at both, and the third was a greater commercial than critical success. What lessons can we learn from them? 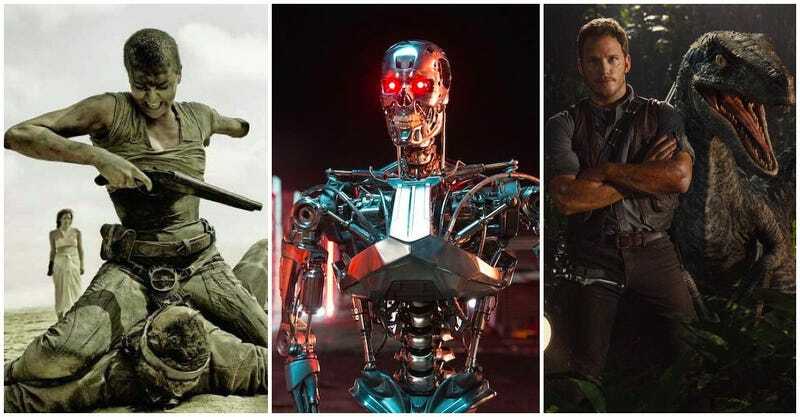 Fury Road, Jurassic World, and Genisys each had a completely different approach to the continuity of their franchises. Fury Road’s approach was nebulous. The main character had the same name, but was played by a different actor. Fury Road called back to the original trilogy, but didn’t explain how it fit into the continuity. This minimalism really worked in Fury Road’s favor. It left it up to us to tease out the connection, or just imagine a completely different history if we wanted to. Which is actually an easier route to take, since it’s hard to figure out exactly how to reconcile this movie with every part of the others. And Fury Road doesn’t bank on nostalgia nearly as much as the other two films, which makes it much easier for a new generation to jump on board. Jurassic World went a different route. It’s a direct sequel to the first Jurassic Park, ignoring a lot about the other sequels. It calls back to Jurassic Park a whole lot — they visit the original site of the park, drive in one of the original cars, and one of the dinosaurs from the first movie shows up epically in the finale. It repeats a lot of the beats of the original, just with new people learning the same lessons. In that respect, it’s much more tied to its history than Fury Road. It’s stuffed full of Easter eggs and explicit references to Jurassic Park. It’s not trying to reinvent the wheel, just remind you of the beloved first movie while also being just as entertaining. Genisys is obsessed with its continuity. It takes the time travel/alternate timeline route of attempting to restart the franchise. The core of the plot rests on the why and how the timeline of this movie isn’t the same as before. It over-explains this to the audience, which perversely draws attention to all the ways this story makes no sense at all. The first twenty minutes are packed full of exposition and voice-over, and it’s still confusing. Plus, it makes the very entertaining choice of giving Arnold Schwarzenegger all of the technobabble lines. Which is fun, but does not help comprehension of its insanely baroque premise. Because of Genisys’ decision to re-tell the plot of The Terminator, but with a new-timeline twist, the film handcuffs itself to continuity. What’s the same? What’s different? This sequel has to recreate a bunch of iconic bits from the original, and then try to make them its own. It invites comparisons and fails to stack up. Fury Road proved that not only do you not have to be bound to continuity, you don’t even have to explain why you’re ignoring it. Jurassic Park showed that you can embrace the parts you love and discard the parts you don’t. Genisys showed that, sometimes, you just have to let it go. The plot of Fury Road goes thusly: A warrior helps a group of a tyrant’s unwilling concubines make a run to freedom, picking up another prisoner along the way. Most of the movie is the car chase, as the tyrant hunts them down. The themes—redemption, humanity, equality, fertility—are complicated, but the plot is not. Everything you need to know is on the screen. Jurassic Park’s plot is that a now fully-operational park loses its new star attraction, which was specifically bred to be big, mean, and scary. Our protagonists have to stay alive and try to keep the dinosaur from killing everyone, while dealing with a company hack who wants to use the escape to prove how awesome his militarized dinosaurs are. Genisys’ plot is that, in the future, John Connor leads the resistance agains Skynet’s killer robots. They send a Terminator back in time to 1984 to kill John’s mother, Sarah, before she can give birth to John, so John Connor sends Kyle Reese back in time to stop it and save her. Except that when they do that, something attacks John, splintering the timeline. So nothing Kyle knows about the past has actually happened. The machines tried to kill Sarah when she was a child, and not in 1984. But another Terminator saved her. And raised her as his daughter. Sarah rescues Kyle, and they go forward in time to stop Skynet. Except they have to go to 2017, because Kyle’s memories of the timeline he never experienced tell him that Skynet’s changed its plan to take over to ten years down the line. And once there, they find that John has also traveled back in time. Also, he’s an evil super-Terminator made up of nanites. So they have to stop Skynet and defeat John, their own son. That’s the condensed version of the plot. Time travel’s built into Terminator, so that’s kind of unavoidable. But knowing that the franchise has a concept so fraught with complications, Genisys should have streamlined as much as possible. Make John the villain, or have Sarah Connor be rescued as a child. The objectives were just too numerous, and changed too much, for an audience to keep track of. If there needs to be pages of dialogue to explain what’s happening, then the film’s failed to understand what the phrase “visual medium” means. Fury Road showed that you can sketch a plot very lightly, using performances and world-building to enrich the film. Jurassic World probably had one too many plots, with InGen’s attempt to prove that dinosaurs have military applications. But, at the end of the day, the only thing audiences really need to get is the core plot mover. Which, in Jurassic World’s case, was “get away from the dinosaurs.” Genisys never stopped changing the ground, which made it a mess. This is probably the most important element of reinvigorating a franchise. If it’s an original film, you don’t have to worry so much about expectations. But if you’re working with films people think of as classics, you have to deal with them. A Mad Max movie has to have excellent action sequences. It has to have cars and fights. Fury Road delivered that, with practical effects, stunt coordination, CGI where necessary, and beautiful cinematography. What it added to the mix was a depth of motivation and a new richness of world-building. All Jurassic World really needed to deliver were dinosaurs. It needed to bring back the wonder of seeing the park of the first film. It didn’t quite do the second — the special effects weren’t nearly as revolutionary, and the CGI a little too heavy-handed. There was less heft to these dinosaurs than in Jurassic Park. And audiences are too used to CGI now. More practical effects probably would have helped. On the other hand, tense confrontations with angry dinosaurs, attacks on a completely full park, and a giant dinosaur battle were more than enough to be entertaining. Genisys needed to deliver action and thrills. It even had Arnold, which should have been half the battle. What it delivered instead were ten pages of exposition, action scene, ten pages of exposition, action scene. This constant stopping to explain the plot killed the action. Taken on their own, the action scenes were fine. But they weren’t the soul of the movie. The soul of the movie was how much it screwed around with the established canon. Which isn’t what you see Terminator for. There are, of course, other reasons that these films turned out they way they did. Fury Road was in the hands of its original creator, while Jurassic World and Genisys were not. There were casting decisions, marketing, and issues of audience appetite for another installment. But these films still made defining choices, which shaped them for good or ill.